For decades, 65 has been that magic age for “retirement” – leaving a longtime job and riding off into the golden years with visions of vacations, grandkids and hobbies dancing through graying heads. 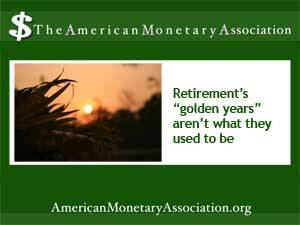 But a variety of social, economic and personal factors are turning the notion of a true retirement age on its head. And that can be both a good thing and a very bad one. might be offered the senior discount in a store at ages ranging form 50 to 65. You can take early Social Security at 62, but for some born later on the curve, full benefits won’t kick in until 67. On the other end of the spectrum are people who reject all the labels and choose to just keep on working, or start a new career or enterprise that carries them through the next quarter century or so of life. And while the movement toward non retirement is growing, many people who hoped to retire in the traditional sense end up working, often at low wage service or fast food jobs, just because they can’t retire: there’s simply not enough money. It’s now estimated that a worker just starting out needs to save at least half a million dollars during a working life of at least thirty years in order to create a retirement that’s secure and comfortable where there’s no need to work again. But economics may make that impossible. Many of today’s retirees have seen pension programs raided, eroded or scaled back for a variety of reasons that leave them with far less retirement income than they’d anticipated. Because of all these factors, the workforce, far from getting younger, is getting grayer as the traditional age for retirement gets pushed back ever further. And leaving aside studies that indicate that working contributes to mental acuity and physical and emotional well being, many midlife people are still hoping to hit that point when they can kiss the nine to five goodbye. But when exactly is that? And how do you prepare for it in such uncertain times? The answer, say financial planners, is as individual as the people involved. Factors include the “official” ages established by workplaces and government programs such as Social Security and Medicare. But other considerations of health, circumstances and outlook also apply. Whether you opt to retire in the traditional sense at 62 or keep working till you’re 95, financial experts stress that it’s important to be proactive – and to figure out what retirement means to you, and what you need to sustain it or what could e a full third or more of life.